If we want to understand the present, we have to study history. 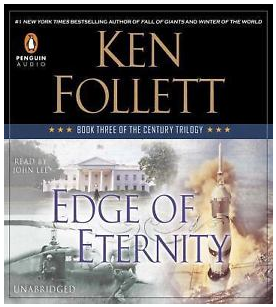 This is what we can do reading books like the Century Trilogy by Ken Follett which is an easy and nice way to learn about our past. Last week I finished to read the third and last book called “Edge of Eternity” about the Cold War, after reading the first one about the First World War and the second one about the Second World War. I would like to sum up some interesting facts of the Cold War era in this post. This book begin after the Second World War with the construction of the Berlin Wall when Germany was divided in 1961, which cut off Germany in West Berlin and East Berlin because Eastern Bloc wanted to protect the population from fascist people who conspired to avoid a socialist state in East Germany. However, the truth for the construction of this wall was to prevent the emigration from the Eastern Bloc to the West Bloc due to the fact that most people didn't want to live in a comunist state. Another important fact for these years was the Civil Rights Movement in the EEUU from 1955 to 1968 that it is also referenced in this book. African people and black communities claimed civil rights like the right to vote and non-discrimination policies which was led by Martin Luther King who was killed by a robber and thief white man in Tennessee when King was supporting a strike. However, according to some conspiracies, King was killed with the government support. In addition, John F. Kennedy was also killed in 1963 while he was in a political tour in Texas. Returning to Europe, comunism and the URSS was harassing the East Europe. For instance, the reformist Alexander Dubcek launched an action programme of liberalizations to Czechoslovakia called the Prague Spring with the aim of building non-totalitarian policies, ligalize political parties and trade unions, freedom of the press, freedom of the speech and movement, right to strikes and demonstrations, etc. However, the Soviet Union along with Bulgaria, Hungary, Poland and the East Germany, which were in the Warsaw Pact, invaded Czechoslovakia in 1968 to avoid the reform movement led by Dubcek. In the end, Czechoslovakia was dominated by Soviet Union till 1991 when the URSS was dismantled. At the end of this book, we are going to read how the Soviet Union, with Mijaíl Gorbachov in the power, was broken up when Gorbachov gave freedom and democracy to the population and he wanted to reduce corruption as well. In addtion, the Reagan Doctrine which supported the yihad against the Soviet Union and the low prices of petrol in Saudi Arabia exhausted the URSS which didn't have enough money to maintain all Soviet Republics. Therefore, the communism was abolished and with this historical fact the Berlin Wall was demolished too in 1990. Regards my friends and remember, study your history because it's a shame that this kind of facts seem too old when it was just some years ago.